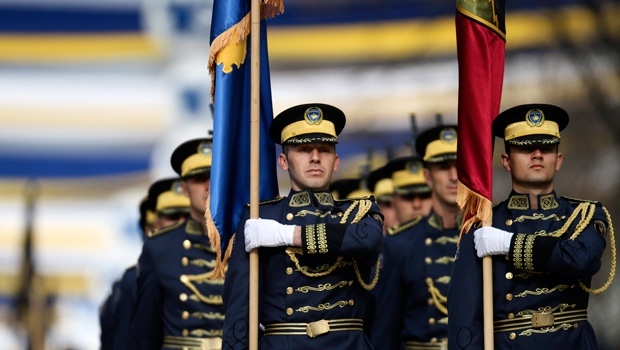 PRISTINA, Kosovo -- The Kosovo Assembly, or Parliament, convened in a special session Sunday to celebrate the country's 10 years of independence -- a ceremony boycotted by the country's ethnic Serb lawmakers. Speaker Kadri Veseli pledged that "the second decade of independence would be focused on the economic well-being of Kosovo's citizens." The second day of celebrations continued with a parade of military and police forces and a state reception. In Feb. 17, 2008, Kosovo's Parliament unilaterally declared independence from Serbia nine years after NATO conducted a 78-day airstrike campaign against Serbia to stop a bloody crackdown against ethnic Albanians. Kosovo is recognized by 117 countries, including the U.S. and most Western powers but Serbia still sees Kosovo as part of its own territory and has the support of Russia and China. A day earlier in Serbia's capital, Belgrade, Serbian Foreign Minister Ivica Dacic said Kosovo's independence remains fragile and won't be concluded without an agreement with Serbia.